Many people working in corporate treasury and finance teams struggle to gain visibility over current cash flow levels due to an unwieldy number of accounts. The vast array of different accounts means that the manual, slow, and administratively heavy task of accessing bank account information prevents any kind of real-time, or even daily view of headline cash figures from across the business. Some businesses may try to consolidate and reduce their number of accounts to make this monitoring a simpler task. However, this is neither easy nor practically viable in the long-term, particularly if the business is growing. Instead, the most effective solution is to automate the task and flow of information, therefore negating the impact of the large number of bank accounts and enabling live cash flow visibility from across the business. This is known as bank reporting connectivity and, to aid those looking to improve their cash flow visibility, we have created a practical guide which outlines what bank reporting connectivity is, how it works, and how it can benefit treasury and finance teams. The guide can be found by following the link at the beginning of this paragraph. What are the benefits of bank reporting connectivity? As mentioned above, bank reporting connectivity offers a way to automate the process of accessing bank account data. It means that all key information is pulled automatically into the company’s cash forecasting and liquidity reporting systems overnight (or more frequently, depending on process in question), and reworked and reformatted to offer headline KPI numbers. This means that when treasury and finance professionals reach their desks in the morning, the reports are ready to go. Therefore, when the CFO or Finance Director asks for an up-to-date report on cash balances and flows from across the business, their request can be completed at the touch of a button. In short, bank reporting connectivity is the key to achieving effortless live cash flow visibility. What formats do the bank files come in? This area is discussed at length within the pdf guide itself. However, simply put, bank files are received as electronic bank statements, which are a coded file type that can be easily read by other systems. While they come in a variety of different file formats, the most common in the USA is BAI2, and the most common in Europe is MT940. Although each of the file formats differ slightly, they all contain broadly similar data components and, as such, mostly provide the same levels of data. What are the main methods of file communication? There are a number of different ways that bank account data can be transmitted electronically from a bank to a company and, correspondingly, from a company to a bank. However, for the sake of simplicity, here we’ll focus on the three most common protocols, which are: Secure File Transfer Protocol (SFTP), Electronic Banking Internet Communication Standard (EBICS), and Society for Worldwide Interbank Financial Telecommunication (SWIFT). SFTP is a protocol that supports the transportation of bank files in a secure and safe manner. Banks typically offer various types of file transfer that leverage this protocol, such Host to Host communication or Managed File Transfer (MFT). 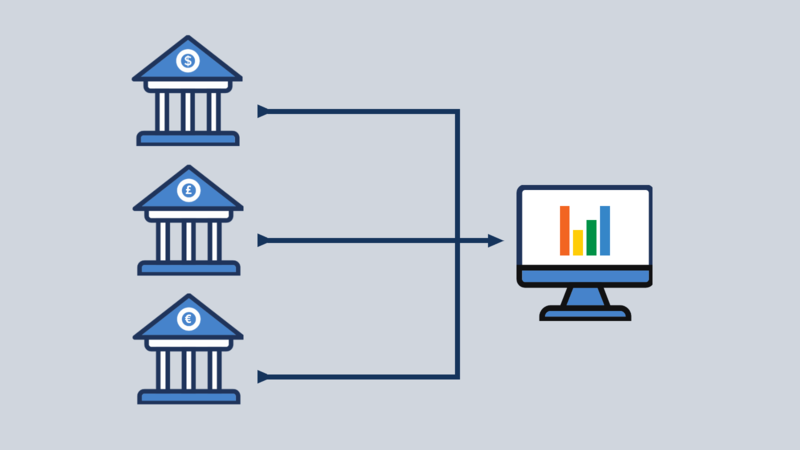 This is the main method of file communication followed when automating bank account reporting, and the one we examine in more detail in the section below outlining the steps involved in setting up bank reporting connectivity. EBICS is a European transmission protocol developed in Germany for sending and receiving payment and statement information via the internet. Since its inception, its use has extended to France, and the majority of German and French banks support its implementation. EBICS facilitates both bank to bank, and bank to company communication. SWIFT enables financial institutions and corporates to send and receive financial messages on the SWIFT network. Companies can go through a process to join the SWIFT Network and obtain a SWIFT Code, also known as a Bank Identifier Code (BIC). 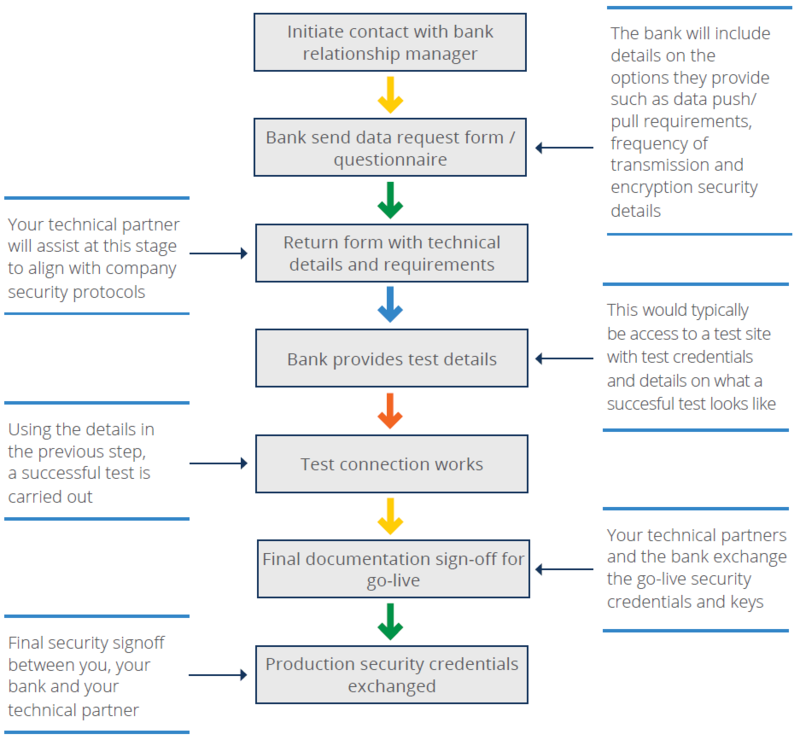 The diagram below shows what’s involved in setting up banking connectivity, laid out in a series of practical steps. Not all banks will follow the process in this exact order, but our experience shows this is a representative overview of what’s involved. As mentioned above, individual banks will have their own process, the details of which can be easily obtained from your bank relationship manager. In terms of timelines, this set-up process usually takes approximately 4-6 weeks. As mentioned, the above article provides a broad overview of what bank reporting connectivity is, the benefits it offers treasury and finance teams, and what’s involved in setting it up. If you would like more information, we welcome you to download the full whitepaper by clicking the following link: Practical guide to bank connectivity: The key to live cash flow visibility. As a dedicated cash flow forecasting software provider, CashAnalytics uses bank reporting connectivity to help improve our clients’ cash forecasting and liquidity reporting processes. Automating this element of liquidity reporting removes the administrative burden from the process, enabling treasurers and finance managers to focus on higher value analytics activities.